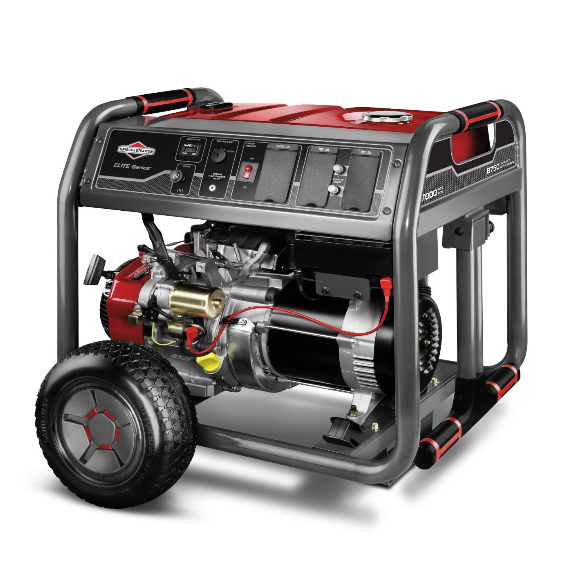 This Briggs and Stratton 30470 gas powered generator is easy to store and use. It has a powerful engine that will last a long time and is quiet. This product sells for about $900 on Amazon. It comes with a 12 inch wheel portability kit and wheels easy enough to roll on rough surfaces. It comes with a fuel capacity of seven gallons and a two year warranty. It is ideal for any user taking it on a camping trip or experiencing a power outage. It has a powerful engine and is able to run 7,000 watts continuous and 8,750 watts surge. There is a cast iron sleeve that also helps protect its powerful Briggs and Stratton Elite 2100 Series OHV engine. It also has 4 120 AC outlets and one 120 volt 30 amp locking outlet. Other features include the ability to run for eight hours on half load on 7 gallons of fuel, its fold down handle to save space, and its never go flat tires for easy portability. This product is recommended for its multiple features and it is easy to use. The built in hour meter helps keep track of oil changes. An additional feature is the automatic low oil shut down to protect your investment.